1335MABINI:Project Space (Performance) presents Tengal—Louis Laurain Duo & Company (Ltd. & Co.): Space Transmissions, a radio transmission performance to be held on Saturday, 8 February 2014, 8:00pm. 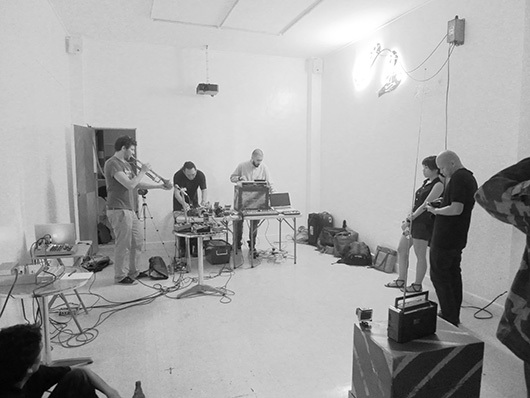 The "Transmissions" series is an audience interactive, live electronic music performance series about the transmission of culture through the information media of sound and radio. It redefines the relationship of performers and audience to the radio medium, opening audio spaces to unheard voices in diverse communities by emphasizing the ability of both to create both the content and the means of production of radio communication. In a room the musician(s) produces (together or separately) a live performance. This performance is recorded then broadcast through a radio transmitter. In this room, the performance is not amplified (no sound for electronic instruments, just acoustic sound for acoustic instruments). Many FM radio (20/30) devices are scattered in the space set on the FM frequency that broadcast the ongoing performance. Some of the devices (5 to 8) are playing some pre-recorded bits of a previous performance of the same performance. Thus it creates an echo/anticipation of what is happening in the live performance (on the radio). The audience is also encouraged to bring their own radios, as well as bringing portable radio receivers, mobile phone radios, especially battery powered boom-boxes and play its sound into the space while moving through it. The audience is thus made a creative partner by playing these radios and the event becomes an interaction between the musicians, audience, and the sounds and themes presented in the transmissions. Personal radios are electronic musical instruments that we all know how to play. We adjust their loudness and tone-quality to our taste and we move them around in our environments to accompany us in our lives.